Romeo + Juliet stands the test of time. 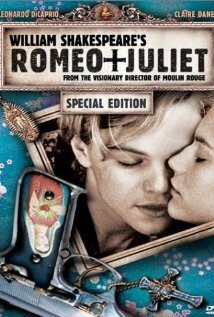 After reading a letdown of a book purporting to be in relation to Shakespeare’s “Romeo and Juliet,” I felt I had to re-watch Romeo + Juliet, directed by Baz Luhrman to cleanse my mind of poor attempts at romance, setting, and most importantly, emotion. Say what you want about Baz (Somehow calling him “Mr. Luhrman” just seems wrong), but he, like “the Bard” understands entertainment. His movies might not be to everyone’s taste, but they are certainly not boring and have no problem in embracing witty, if sometimes bawdy, humor. At the time it was released, Romeo + Juliet was a revelation. No one had attempted and succeeded at translating a Shakespearean play, and especially the actual wording, into something that an average modern audience member could understand. Many attempts have been made to bring other Shakespearean plays up to date, but most were laughable at best and boring at worst. Even the ones I liked, such as O starring Mekhi Phifer and Josh Hartnett, weren’t inspiring enough that I would ever want to watch them again. A Midsummer Night’s Dream starring Kevin Kline is a nice gem of a film, but it’s not terribly “modern” in its approach to the story. I have seen stage plays far better. Romeo + Juliet is a rare film in that it is something that people, especially young adults at the time, wanted––and still want––to watch. After re-watching Romeo + Juliet this week, I find that it is just as good today as it was in 1996. Baz’s Moulin Rouge and Australia are cringeworthy in comparison––and I like both of those movies! The remarkable thing is, the language works in the frenetic pseudo-Los Angeles/Latin American setting. It isn’t so odd that the characters refer to their guns as their “swords” and why people run entirely by emotion speak poetically and epically. A gang fight isn’t just a fight, it’s the honor of each family running simultaneously back to “let there be light” and forward into the moon turning to blood and stars falling from the sky. The language absolutely works. Baz’s genius is his theatricality, something he shares with Shakespeare. Even if one cannot fully grasp the often difficult Elizabethan wording, one can still grasp the gist of the plot, due to the bold visuals and unsubtle acting. Much like Bollywood movies, this style appeals to the masses, helping them to appreciate classical works even if they have little to no education. Romeo and Juliet look their age. Their relationship is romantic, but in a rash, youthful way. Though they have stars in their eyes, both R and J sense clearly that they may be the demise of each other. They are deep thinkers, though their focus is inward on self, not outward towards the world around them. Mercutio rocks! He was always my favorite character, but he’s extremely attractive in this version (played by Harold Perrineau, LOST) and admirable in his care for Romeo’s honor. He’s the classic class clown who appears to care only about having fun, but in reality cares deeply about his friends and about honor. Romeo and his buddies seem like believable young men. They constantly tease each other, get into fights, make fun of their elders, and cause trouble, repent for two seconds at a time, and begin all over again. Father Laurence. Pete Postlethwaite (The Last of the Mohicans, The Usual Suspects) was perfect for this role. I can’t imagine anyone else playing Father Laurence in this particular version. He was believable in both the Hawaiian shirt and the priestly attire, and especially, as friend and confidante to both Romeo and Juliet. Postlethwaite had a wise yet youthful quality about him. The nurse. Miriam Margolyes is one of those talents that excels in smaller secondary roles. She has been in numerous products including multiple Shakespeare and Dickens adaptations, as well as more modern adaptations, such as the Harry Potter films. Her portrayal of the nurse is both comical and sympathetic. She takes what her employers dish out to her with the stride of a person totally comfortable with who they are. The ending, the ending, the ending!! So perfectly done that even though one is 100% certain that title characters are going to die, the last scenes still put the audience on the edge of their seats wondering if the two lovers will actually ride off into the sunset. It makes the tragic end more exhilarating rather than sorrowful and one can’t help agreeing with the police captain (Vondie Curtis-Hall) that “all are punished,” and punished appropriately. The consequences of such a lifestyle as these characters lead can only be an early death, or the early death of their loved ones. Onto another great Shakespeare adaptation, and possibly my favorite: Much Ado About Nothing (1993) directed by and starring Kenneth Branagh.